LightHouse continues its live listening party for ears only, LightHouse Listenings, on April 11 from 5:30 to 7:00 p.m. at LightHouse Headquarters. Join us for an evening of live music in the dark with award-winning classical guitarist Ioana Gandrabur, as she incorporates music with lively interactive discussions about music, blindness, and non-visual entertainment. Learn more and RSVP for the event. “I used to keep the music apart from the fact of being blind,” says 45-year-old Romanian musician Ioana Gandrabur. Ever since she was young, Ioana felt a draw and a connection to music. After learning the piano at age five, she picked up the guitar, and by age 14 she had won the Romanian National Guitar Competition. At 16, she moved to Canada to study at the Conservatoire de Musique de Montréal, where she graduated with honors. She continued on to Europe, where she studied at the Musikhochschule in Kolh, Germany, the Musikakademie in Basel, Switzerland and the Musikhochschule in Düsseldorf, Germany. Throughout her education and pursuant career as a musician, Ioana was very aware that her blindness impacted how others perceived her identity. With age, she says, she realized that she had a unique perspective on music that she felt compelled to share. Ioana says the opportunity to speak about how her blindness shaped her perspective on music, and music on blindness, attracted her to performing at LightHouse. As part of her LightHouse Listenings performance, Ioana will play a concert in complete darkness – a format she says not only changes how the audience perceives the music, but also how she performs. When she had performed in the dark previously, she remembers instinctively getting up to bow at the end of a piece. She says that this paradox creates a rich space for introspection, and that she hopes to cultivate an musical environment of understanding and appreciation. What exactly are ‘live listening parties’? LightHouse Listenings is an event series dedicated to non-visual entertainment that foregrounds sound (check out this one with Bay Area podcast The World According to Sound, or this one featuring blind adventurer Erik Weihenmayer). We’ll host panels, album releases, live musicians, you name it — if you’re into listening, we’ve got the venue. If you’re interested in staging your event for LightHouse Listenings, contact LightHouse Events Manager Andrea Vecchione at avecchione@lighthouse-sf.org. Over the weekend, Enchanted Hills Construction Manager George Wurtzel placed the last screw in the final hand-constructed and carved redwood benches that are the signature seating of Enchanted Hills’ new 120-person Redwood Grove Theater. It’s a project that has come to fruition over the last 10 years through patience, perseverance and unrivaled community support. And it’s ready just in time for our annual Music Academy Concert on August 12. RSVP for our Summer Music BBQ this Saturday, 4 p.m. at Enchanted Hills in Napa. The idea for the theater was born out of a piece of Enchanted Hills’ history relayed to us by longtime Enchanted Hills friend, counselor and historian Hope Sinclair. Hope’s father, Philip Webster, bought the land in 1927 and operated a boy’s camp there for more than 20 years. Hope herself spent much of her childhood at camp in the 1930s and 1940s and developed a detailed love for the nature and history of the place. From conversations with Hope about the site’s history, Camp Director Tony Fletcher learned that a section of lower camp was often used for meetings and talent shows during its time as a boys camp, due to its natural acoustics. When new CEO Bryan Bashin toured camp in 2010 he instantly saw the potential to restore the disused and junk-filled natural bowl into an outdoor space of unparalleled beauty and usefulness: an outdoor theater area to host concerts, movie nights and large gatherings that would be shady in the summertime and make the most of the area’s fantastic acoustics. Listen to this video from an impromptu performance in the theater to hear the breathtaking natural acoustics. It was in keeping with EHC’s mission and the spirit instilled in camp by founder Rose Resnick, who was a talented musician and former concert pianist who helped make music and performance the part of everyday life at EHC that it remains today. Starting in 2007 with the EHC fire abatement plan, a bowl started to appear as a troupe of goats hired to clear brush in lower camp. EHC then wrangled various volunteer groups including California Conservation Core, 4H Club and the Greater Napa Kiwanis Club to help clear the area even more, and over the next 10 years the project was brought to completion with the care and collaboration of Bill Cinquini, Alan Butler, Tim Gregory Construction and George Wurtzel, EHC staff and a successful 2015 Indiegogo campaign. Thank you to the many organizations and individuals who helped bring the Redwood Grove Theater into being. We hope you’ll visit us up at camp on August 12 to witness the beautiful and one-of-a-kind fruits of our labors. Learn more and RSVP for the Music Academy Concert here. The terraced seating and stage of the Redwood Grove Theater surrounded by lush redwoods. Photo by Marilyn Bogerd. A view from behind the stage of the Redwood Grove Theater. Photo by Marilyn Bogerd. A side view of a crowd listening to music in the Redwood Grove Theater. Photo by Marilyn Bogerd. 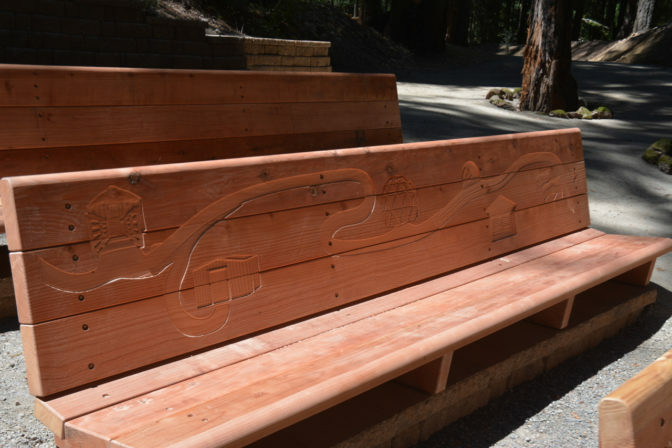 A closeup of the redwood benches, which were individually designed and carved by EHC Construction Manager George Wurtzel. Photo by Marilyn Bogerd. A detail ivy pattern carved into the back of one of the benches. Photo by Marilyn Bogerd.